The following is an edited version of a speech I gave at the launch of our new report Management Matters in the House of Commons on Wednesday 23rd January. To read the report, click here. Thanks to everyone for coming. Thanks in particular to Dr Lisa Cameron MP for hosting us, to Rob May and everyone at the Association for Business Executives for helping making this possible, and for the Minister for Small Business for a great speech. Now, before we jump into the key findings and recommendations of the report, I think it’s worth thinking about why we should and shouldn’t care about business failure. We shouldn’t want to save every business. Creative Destruction is key to economic progress. Shielding firms from competition traps labour and capital in unproductive firms limiting the ability of new entrepreneurs to create wealth and raise living standards. There’s interesting paradox too. Failure rates are highest in the best places to start a business. It shouldn’t really be a surprise. In places like London or Silicon Valley, investors are willing to take risks and back companies that have a high chance of failure (provided the pay-off from success is good enough). It’s also true that we shouldn’t write-off entrepreneurs who fail. There are many great businesses founded by entrepreneurs whose first venture failed. Still that doesn’t mean failure is good or something to be celebrated. As Paypal founder Peter Thiel once said “Failure is massively overrated”. It can sap ambition and while it is a learning experience, it’s highly possible you might not learn the right lesson. Businesses rarely fail for a single reason. That’s why we’re campaigning to prevent unnecessary business failure. While some business ideas are simply bad, there are many cases where an entrepreneur isn’t equipped with the right experience and training to take a good idea further. It’s the idea behind many of our reality TV guilty pleasures from Ramsay’s Kitchen Nightmares to Troubleshooter. The report we’re launching today takes that idea and looks at the hard evidence on management. First, good management isn’t some fluffy vague concept. It’s something that we can measure and something that explains why some businesses are more productive than others. The World Management Survey finds whether or not firms consistently monitor and improve their processes, set and revise targets, and incentivise employees through merit-based hiring, firing and promotion procedures explains almost a third of the differences in productivity between and within countries. Furthermore, one study finds that innovations in management like Taylor’s Scientific Management and Six Sigma Manufacturing have as big an impact on economic growth as the technological innovations we rightly celebrate. 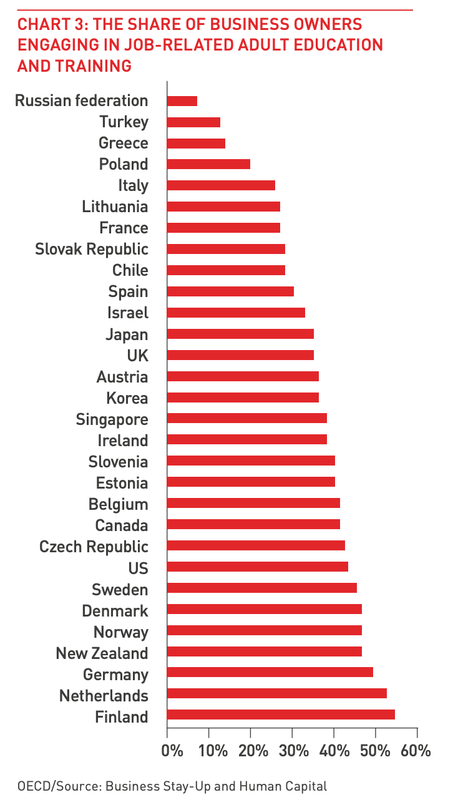 Second, the UK is behind when it comes to management. German, Japanese, and American firms score higher on the World Management Survey. The problem isn’t with Rolls Royce, GSK or, I originally put Dyson here but perhaps I need a better example given current news. It’s our long-tail of underperforming SMEs. Third, not enough British firms are engaging with adult education and management and leadership training. We’re behind 17 OECD nations when it comes to business owners engaging with adult education. While under a third of SMEs offer training for their managers. That’s despite the fact that management and business training programmes like Goldman Sachs’ 10,000 Small Businesses have delivered impressive results boosting revenue growth and productivity. First, we need to know what works. The Government should sponsor randomised controlled trials of the most promising interventions. They should consider setting up a What Works Centre for management capability. Second, We should remove the barriers preventing people from funding their own training. Employer-funded work-related training is tax-deductible, but if a self-employed graphic designer wanted to expand her skill set by taking a digital marketing course, she wouldn’t benefit from a similar tax break. She should. And in 21 out of 30 OECD countries she would. Third, we need to reform the apprenticeship levy to give levy payers more freedom to use their funds to support the management capability of firms in their supply chain. There are management apprenticeships available but there needs to be more flexibility to allow levy funds to be spent on cheaper or shorter courses. Finally, entrepreneurs are most likely to trust information from other entrepreneurs. Evidence from China found that when business owners in different industries were required to meet up and share their experiences they adopted better management practices. In the long-run, creating an environment where organically grown peer-to-peer networks can flourish could be key to upgrading our management capability. Most entrepreneurs will never get visited by a TV crew and a celebrity troubleshooter, but enabling them to get the management training they need might be the next best thing. Older PostIs Silicon Valley merely “reinventing the wheel”?